Lately I have been having conversations with a number of women, from the networking events I attend, to the women who ask for my advice via phone call, text, or DM. The common theme I hear from them is: “I don’t know if I should start my brand, there are so many (insert business or niche field)." My response is always, yeah but are they YOU? Yall, when I tell you, there are so many bloggers out here, but guess what; they are not ME. When I started, I created my own lane. I cut my hair and was one of the few Naturalistas that rocked a taper cut. I infused my style into my brand, sharing how I kept up with my natural TWA and in style!! This was the lane I built for myself. And that is exactly what you can do for yourself as well. We are all unique, and we all have a unique story to tell. Someone around this world will fall in love with YOU and your story, so share that story within your brand or business. YOU are the only YOU out there! And the thing about it is, be unique. Have your own identity and ideas, this will help you prosper!! So just go and thrive and be YOU boo!! k so, real quick, let us chat about today’s outfit! 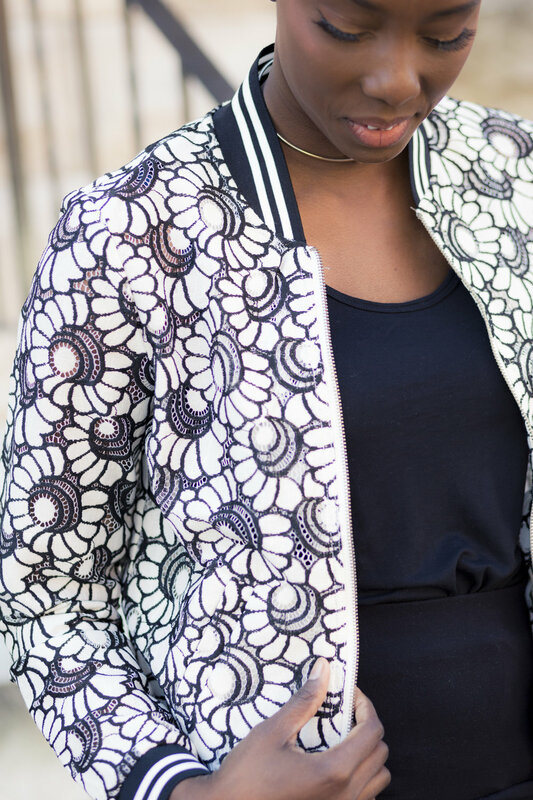 I'm obsessed with this bomber, I found it a Nordstrom and had to have it. I love the detail and the fact that I can dress it up or down is a WIN for me! So you will definitely see this on the blog again styled another way, because its BOMB haha!